And I’d like to thank you all for your thoughtful comments [EDIT: Haloscan link dead], debating the topic, quite rightly pointing out where the Liefeld/Kirby analogy falls apart, etc., and not calling me a prick for even bringing it up. There’s one more thing I’d like to emphasize, however…I mentioned in my post (and other folks mentioned as well) that even Kirby’s throwaway, lesser, “bad” creations are more worthy and memorable than many other people’s funnybook efforts. 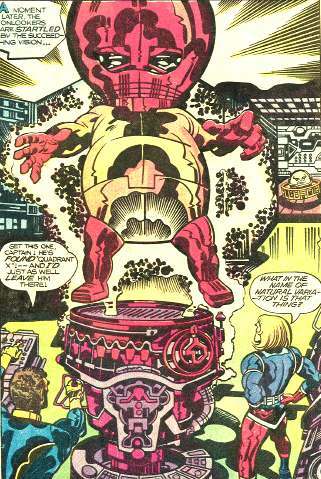 To think that there are people in the comics industry who have never created anything that even comes close to the greatness of the Fighting Fetus — perhaps, arguably, one of the least of Kirby’s countless creations. That certainly puts things in perspective, doesn’t it? Go look at the photo. Go ahead, I’ll wait. “Anonymous person says something really stupid and hateful on the internet.” STOP THE PRESSES.